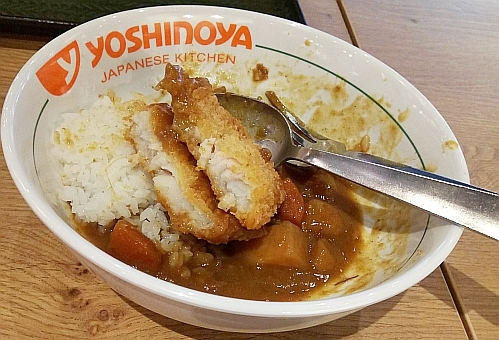 Fish Katsu Curry Rice ala carte (MYR 16.80 nett) at Yoshinoya, Midvalley Mall. I bought it to try after reading that it is NuxV's favourite dish at Yoshinoya but after looking at her bowl, it has some flakes in it. Is it because she ordered the set version that there are additional toppings on it? I like the curry because it is not sweet and has lots of potatoes and carrots in it. The fish is passable with some translucent flesh around the edges. I am satiated after eating half of the portion because I am a small eater. Luckily my friend is with me to eat the other half. Two of us just ordered 1 dish because we are going to eat dessert after this meal. Please click on the above menu for a larger image. 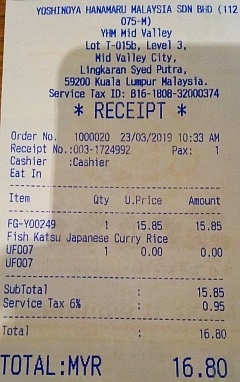 I would order the rice with just curry alone, only if the price is below MYR 10. They are introducing 4 new items that are displayed on the "Jyu Promotion" stand-up banner. I think these are for big eaters because it looks like there is a lot of rice in the box. From Yoshinoya, we just walked over to Snowflake which is located on the same floor. 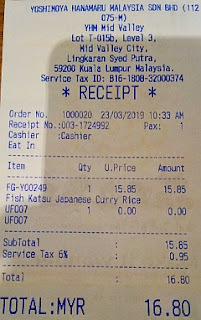 I have every intention of eating Uji'Ryo Supreme (MYR 19.80 nett) but then I am still very full from the fish katsu curry rice so I ordered one Hot Bestseller (MYR 12 nett) for my friend and just add one scoop of Matcha Sorbet (MYR 4.55 nett) for myself. 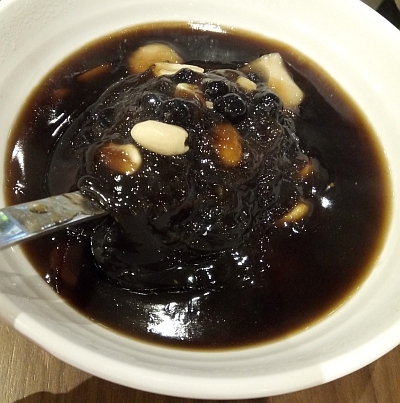 The grass jelly is still in liquid form when it is hot and will turn gelatinous when it cools down. 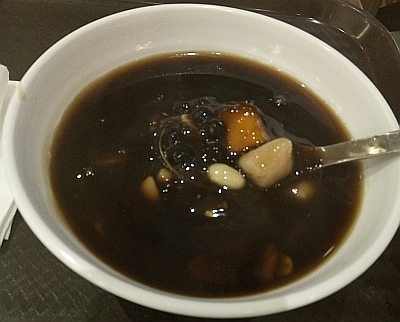 The Yam and Sweet Potatoes Taro Balls, Peanuts and Tapioca Pearls in it are tasty! Now that it is cool, the texture is like jelly. 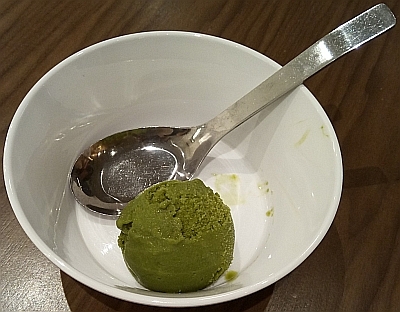 My single scoop of Matcha Sorbet (MYR 4.55 nett). It is not creamy because it is sorbet and not ice cream. The green tea taste is there and it is not that sweet though I would prefer the sweetness level to be lower. I think it tastes better with ice shavings than on its own like this. 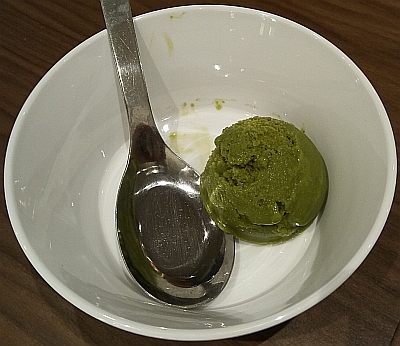 Next week, I will make sure I have enough stomach space for a bowl of matcha ice shaving. Dessert for 2 pax: MYR 16.55 nett. 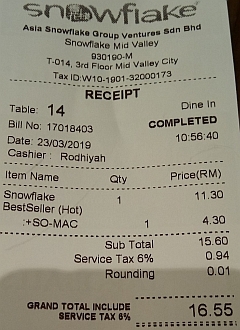 Total spent for lunch and dessert (2 pax): MYR 33.35 nett. 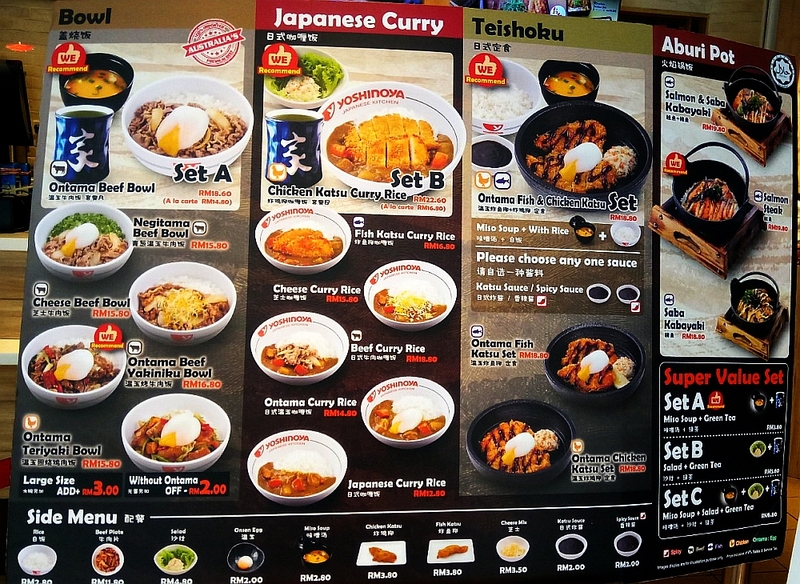 Usually I will order their salmon rice when I go Yoshinoya, yet to try their curry rice. I only like salmon grilled lightly and not with sauce so that is why did not order their salmon rice. 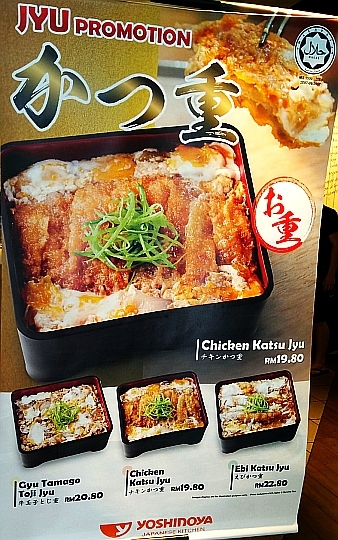 I wish they had that fish set at our Japanese franchise here, ideal for our no-meat Friday. Hopefully they will have it soon. Hopefully they will stay long long long because so far, I see their business is good. Not a big fan of Japanese curry. I dont mind the dessert though. Somehow I like almost all curry except those very, very spicy ones. They tastes good when evaluated standalone. Cannot compare them to the usual curry that we are used to. My family loves Japanese curry and I occasionally cook it for them. Never had one at Yoshinoya though. 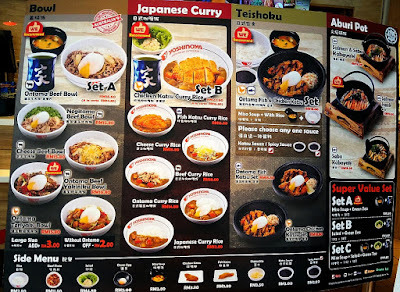 I wonder whether you will like yoshinoya curry or not. 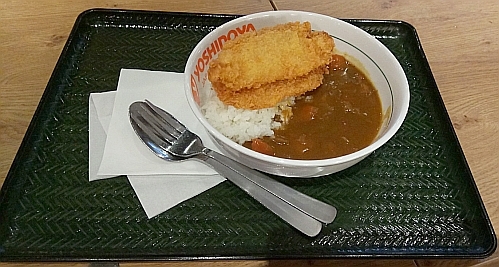 I had Japanese curry with chicken katsu today hee..hee.. The crunchy flakes is available at the side counter where the cutleries, sauces, pickled ginger are placed. It is FOC, but I think that is for udon. It is not provided in the Mid Valley outlet, but in IOI City Mall. I wonder are the flakes tenkasu or bonito flakes. the udon counter is at the other end. I wonder are the flakes there. You are right, at midvalley I didn't see them at the pickled ginger counter. oic. thanks for the info. I would call this heavenly meal to eat my favourite curry rice and then adjourn to Snowflakes!!! you sure can eat both. I think the taste of Japanese curry is very mild. I would prefer the rice and curry to be served separately. true, they are not spicy. the curry is like potatoes and carrots stew gravy. So cute that little ball of matcha icecream.